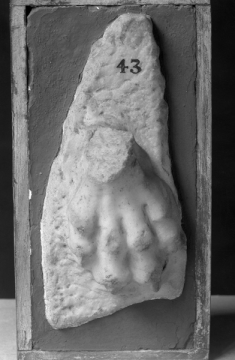 This is a clawed paw on a large, thick base area; judging from the shape of the paw and the size of the slab which it joins, it is probably from an ensemble similar to Soane M801 (Vermeule no. 249). Rome; collected in Rome by Charles Heathcote Tatham for the architect Henry Holland during the 1790s. See Cornelius Vermeule, unpublished catalogue of the Antiquities at Sir John Soane's Museum, Introduction, transcription of Tatham letters, List 1, no. 51.